Not as important as writing about the current state of yoga, but I’m tired….turning inward and slowly checking out. I've recently met a couple of women with full-body tattoos. While I could see only the designs on their arms and legs (which were probably only a fraction of their whole body canvas! ), it was interesting to note their artistic choices–and the skill of their artists. Looking at your back design, I say wow, great work! I am also intrigued by the choice of the hibiscus, which is my home state flower: Hawaii's yellow hibiscus. On my home island of Hawaii (Big Island), I see red hibiscus all the time! it looks nicer now, that photo was taken immediately after so kind of raw…now it is more mellow…. 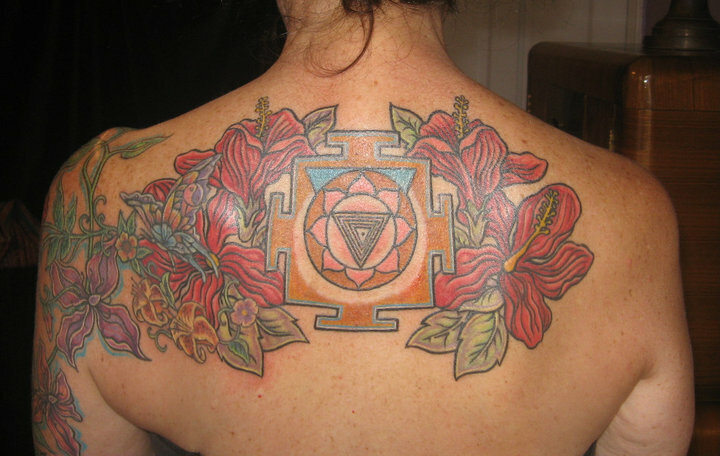 red hibiscus is Kali's flower…that is Kali's yantra, lots of meaning in that sacred geometry…. thanks for stopping by, Spy! I love seeing thoughtful, intention filled ink – it just makes me smile and want to do a little dance. I spent a rather long time earlier in the day admiring my lotus and snake on my sacrum so it was funny to see this today – here's to many years of beauty spread via your backside!